From the community launch of LT’s Leadership Initiative for Texarkana (LIFT) in April 2012, Leadership Texarkana’s defined intent was to host a retreat for the City Leadership teams of the two Texarkanas to build trust, respect and a foundation for working together as partners in future endeavors, and that is exactly what happened at the LIFT City Leaders’ Summit, and with outstanding success, due the efforts and support of many individuals, and in particular, to the elected officials who took the time to attend. What is needed to move our community from our citizen’s long-expressed VISION of the two Texarkana’s Working Together to taking the ACTIONS which will make it so? or the necessary structures and processes? With community expectation developed and expressed through the LIFT sign-ons and community editorials over the months preceding the Summit, the requisite foundation for addressing the remaining challenges depended first on developing the trust and respect necessary to work together; consequently, it was the focus of the Summit. Preliminary summit sessions began on Thursday with two wary groups of individuals on the City Leadership Teams, (one member of which admitted that she was coming “kicking and screaming”), but ended with one unified cross-stateline group of community leaders genuinely committed to working together, in conjunction with the Chamber team, for mutual benefit, brainstorming about how they might coordinate actions, ensure ongoing and effective communication, and engage all citizens in supporting their efforts. The evolution of group interactions over the summit sessions was profound, with individuals by Friday afternoon leaning in to hear one another and to contribute to brainstorming and problem solving in small mixed-city groups. As a result of the Summit sessions, the City Leaders committed to regular joint meetings of the city managers for ensuring best use of resources and for communicating back to their respective boards, as well as a follow-up joint meeting hosted by the Chamber. (Even though there are representatives from both Texarkanas in the Chamber offices every day, working together for best community outcomes, one of the most profound realizations from the Summit was that the majority of the generous individuals who serve the two Texarkanas had never even met prior to the Summit, which made it unsurprising that they were wary of each other. For going forward, Summit Leaders Heiny and Clark also provided the city leadership teams with a summary of the many other ideas which the City Leaders had generated during the Summit, with a priority focus on establishing structures and processes needed to work together effectively, now and in the future. There was general agreement that our community’s future lies in thinking in terms of our whole region, but that it will be useful to walk before running. and that the community has a role in making it all happen. The city leaders admonished the citizens present at various sessions to “hold our feet to the fire” on this and “call those who didn’t participate” and let them know you want them to get involved. (All but two attended at least one portion of the Summit). WORKING TOGETHER is our community’s priority need, because until we are working together, jointly prioritizing and focusing our efforts, and using our community’s resources to our mutual best advantage, we will not be maximally effective at accomplishing any of the goals which our citizen’s have reiterated over the years. The opportunity exists for Texarkana USA to be a community that’s not only One of a Kind - but also authentically Second to None–a community which excels because we are WORKING TOGETHER to pursue our citizen’s repeatedly desired goals, whether for Beauty and Pride of Place, for Educational Excellence and Cultural Riches, for attracting and retaining the Best and the Brightest or for any other goal related to our Social, Economic and Personal Well-Being. As the Summit Leaders reminded all present: Texarkana is by no means unique in its challenges in working together - but Texarkana USA’s competitive advantage can be that we are actively doing something to address it. The Summit spirit was overwhelming and positive, but in the moment, conferences like the LIFT Summit typically do produce a “heightened sense of possibility.” The test will be in the changes observed and in the outcomes manifested as the days and months pass. Leadership Texarkana is committed to lasting changes and new outcomes by being the engine which powers forward movement. LIFT is about citizen engagement, and the citizens are engaged. LIFT is about unleashing and fostering outstanding leadership capacities which are already embedded in our community. Our community has unquestioned capacity for being Second to None, but it usually requires crisis: whether a threat to RRAD or Cooper Tire, or the airport. The goal is to see the same commitment to focused joint action when faced with opportunity or in addressing other issues. 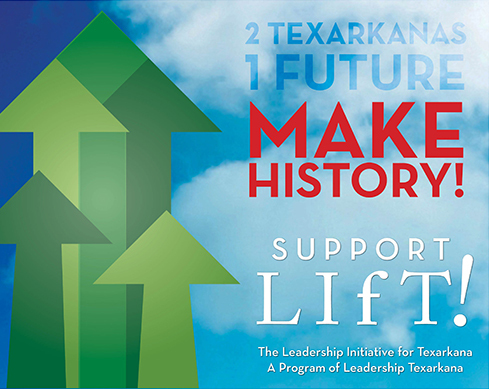 This LIFT Summit was a FIRST step for the Leadership Initiative for Texarkana. With the continued engagement and support of Leadership Texarkana graduates, city officials and the community at large as partners with Leadership Texarkana, there is invaluable opportunity for moving ahead. The plan for a City Leaders’ Summit was not any one individual’s. With Fred Norton’s leadership as chair, the LIFT Team brought the LIFT thinking forward through many generations from their first meeting in January 2012, not wiggling on WHAT LIFT was intended to accomplish, but really hashing out HOW BEST to change the way we do business in Texarkana. The meetings were never dull; there were as many ideas on how to proceed as there were individuals involved. Many times the group went back three paces to move forward four, but always remained headed in a positive direction. From months of thoughtful discussion and mutual commitment to our community’s best future, the consensus reach was that the best place to begin was at the beginning: and so the LIFT City Leaders’ Summit.